GERALD YEUNG is the youngest Proverse author. In summer 2006 he made a back-packing journey with four of his best friends, Justin, Louis, Brian and Pierre and wrote a journal about his travels, which brings out the lighter side of Latin America in the tone of a spoiled teenager. His first book for Proverse, Wannabe Backpackers: the Latin American & Kenyan Journey of Five Spoiled Teenagers was published on 11 March 2009 to coincide with the Man Hong Kong International Literary Festival. Gerald Yeung (Wannabe Backpackers; 2nd from left) spoke at the 2012 HK Book Fair at seminars organised by OUP. 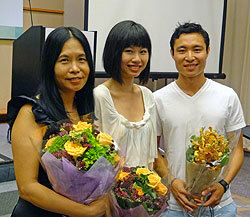 Gerald (R) poses with freelance writer, Nicollete Wong (centre) and Proverse author Emily Ho (Memoirs of an Ice-Cream Lady) (L).